After 4 months of low season the Phi Phi September weather doesn’t dull the enthusiasm for the high season ahead and the anticipation of great weather to come. Everywhere, from the bars to dive schools, hostels to luxury resorts, everyone is busy getting everything just so. High season is two to three times busier than low season; high season is the time the local businesses make their money so everyone seems inordinately happy. The atmosphere can be in stark contrast to the weather where it can rain hard. Phi Phi September weather is effected by the sun passing over head in its southerly return to the equator. This can create massive clouds (up to 10,000m deep) caused by convection and stunningly beautiful rain showers, the like you have never experienced unless you have spent time in the tropics. This can be accompanied by strong lightning storms. However when these clouds use up their energy, the clouds dissipate and leave the skies a brilliant blue, perfect for diving or being out on the beaches. The air temperature during Phi Phi September weather is 33-35 degrees C but this can drop 8 degrees very quickly during a down pour of rain. This quickly reverts back to 33-35 degrees C once the rain stops. The sea is 29 degrees C but can be cooler in the first 50 cm because of the rain. Phi Phi September weather can experience storms. Predominantly these are cyclones or massive lows that have built up in the Bay of Bengal. Phi Phi Island is some distance from these but can experience extended windy and wet weather. A big storm might last 3-4 days and though the tours run a limited itinerary and the bars with roofs are kept busy with trade, the island is more subdued than normal. Rarely, but they do happen every 5-10 years, a storm will be the result of the tail end of a hurricane from the Gulf of Siam or east side of Thailand. These have a similar effect to a bad storm from the Bay of Bengal. Phi Phi September weather stops the vast majority of tours and trips reaching Maya Bay. Maya Bay is where Leonardo Di Caprio made his movie "The Beach". The main sea entrance to Maya Bay is on the west and is surrounded by vertical cliffs. This whole area is impassable and dangerous to all types of vessel. 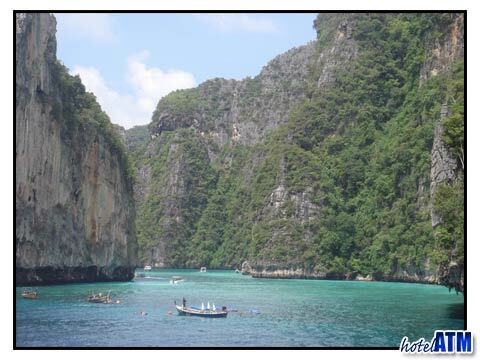 There is a 'walk through' from Loh Samah bay on Phi Phi Ley which can be attempted in September. This is a somewhat precarious, a swim ashore, scramble over the boulders in the surging waters and clamber through a hole in the cliff. You then walk 4 minutes to the back of the Maya Bay past the National Park offices. It's quite an experience to arrive at Maya Bay in the middle of a storm with no one on the beach. Phi Phi September weather does affect diving as you might imagine. However the tall cliffs off Phi Phi Don and Phi Phi Ley make for exceptionally calm water even in a storm. The eastern side of the mountains have many good dive sites which, in this quieter period, can make interesting adventures for many days. The Bida Island, Phi Phi Shark Point and Hin Muang are very exposed to the waves and are rarely dived during September. Phi Phi accommodation is protected from the September weather as all the resorts are on the east side of Phi Phi Don or in case of the main village and pier, the east side of the Phi Phi Don mountains. This ensures that the hard wind never reaches where you stay and intact Tonsai Bay is a flat mill pond and safe harbour throughout the year. September is a great month for Phi Phi Hotel Deals that sit on top of low season prices. The combination of Free Night Specials, Fixed Night Promotions, Special Discounts, Early Bird Offers Honeymoon offers on low season prices can give you room rates that are upto 70% cheaper than peak season prices. Phi Phi September weather does affect the ferry journeys but not the timetables or schedules. The ferries will leave on time every day but when a storm comes through they might be ordered by the maritime police to stay in harbour. This happens rarely but must be taken into account if you have an onward journey like a plane from Phuket International Airport. The westerly wind during the Phi Phi September weather picks up some big waves. This will mainly happen on the Phuket to Phi Phi ferry at the southern tip of Phi Phi Don where the westerly waves bounce off the cliff face and amplify the existing ones. The largest ferry and the most comfortable ride is the Sea Angel. Krabi to Phi Phi ferry ride in September is not so bad as the majority of the ferry ride takes you in the lee of Phi Phi Islands out of the worst of any waves. 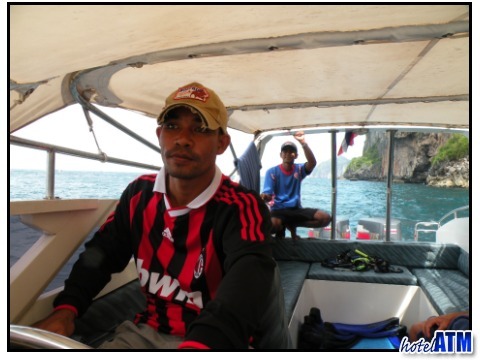 If in doubt take the ferry Phuket to Phi Phi and then Phi Phi to Krabi to get the best crossings in September. In an aside, Dolphins are seen in September on the ferry routes to Phi Phi and sometimes in Tonsai Bay or Loh Dalum (Dolphin Bay).